This image shows Kendra Kannegaard with police officers with her van that was stolen and later recovered on Nov. 16, 2016. SCOTTS VALLEY, Calif. (KGO) -- There are few people happier in the Bay Area today than San Jose State student Kendra Kannegaard. 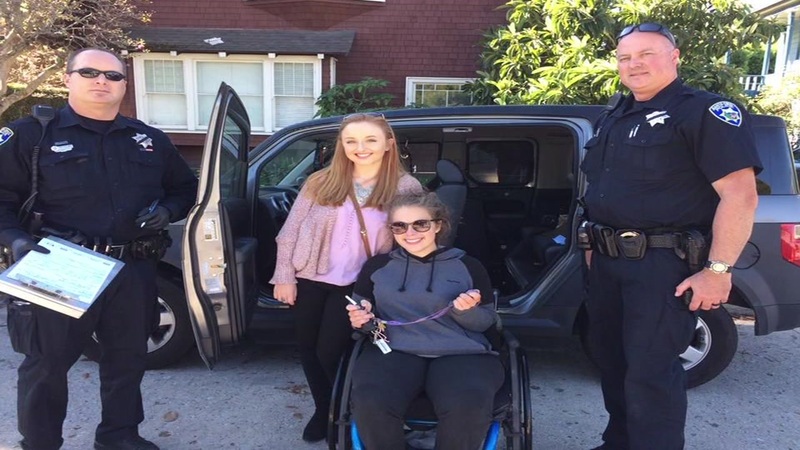 The 23-year-old, who's been confined to a wheelchair for six years now, is all smiles after getting her specialized van back. Someone stole the vehicle from outside her Scotts Valley home on Friday. A woman spotted it Wednesday near the boardwalk in Santa Cruz and called authorities. Kannegaard says she was amazed by the outpouring of support she received.